In the summer of 2008 we were contacted by the designers and owners of the Irish Java Republic Coffee brand to develop some of our bamboo lights for a new, large cafe and roast house in Ballycoolin, Blanchardstown in Dublin. The intended space which had a high 7m ceiling within a warehouse style building with lots of glass was found to be cavernous and cold so our Bamboo collection was chosen for it’s possibility to be made in large sizes and it’s warmth in terms of light output. The colour and texture of bamboo also suited the brand in terms of it’s connection with the asiatic origins of Java coffee. The large volume enabling us to design very large H1400mm DIA 1800mm fittings and a variety of smaller sizes. 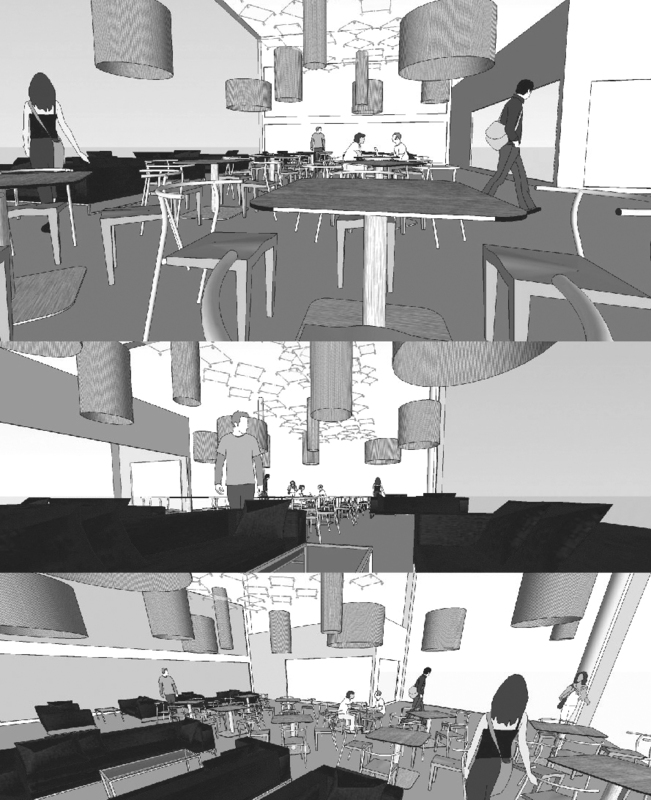 We produced Sketch-Up images of the space with the shades in place so the client and designers could visualise how they would look from different viewpoints. The shades were hung at various heights through the space with multiple light sources in each shade. We also provided coloured Acrylic diffuser discs for each fitting however the client opted to leave these out of the fittings in the end in favour of a purer approach. Our Bamboo fittings have proven very popular over the years for their warmth and atmospheric qualities. We can produce them in many cylindrical sizes with telescopic forms also available. These can be made in 2 thicknesses of bamboo to give a variety of texture and colour. White or coloured, recessed diffuser discs can also be ordered to hide internal light sources. Multiple lampholders are installed in each fitting with LED bulbs being the most popular fitting type today.